(without stand or speakers) 31.3" x 21.5" x 4.4"
JVC's beefs up its 3rd Generation line-up of widescreen high definition flat panel displays featuring TeleDock with the addition of 120Hz Clear Motion Drive. Imagine an LCD that you can playback your video content that you have downloaded to your iPod. Well you can with a built in dock that will not only playback and upconvert the content to 1080p but it will charge it too . Our line-up of panels was not only engineered to excite the most extreme audio visual enthusiasts, but also to influence the creative minds of the most discriminating home decorators. This JVC 32" Class LCD television with stylish cosmetics, takes into consideration every feature the demanding digital customer is looking for now and for the future. 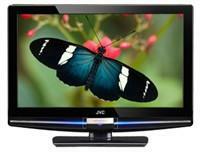 It offers a 4800:1 Dynamic Contrast Ratio, 500 cd/m2 and a 178 Degree Viewing Angle. This units connectivity takes into consideration today's digital world and includes an ATSC Tuner, 3 HDMI Inputs, USB Photo Viewer and a Component Video Input. Ideal for any room in the house!